When your guests approach your Tennessee home, the first thing they’ll notice is your front door. 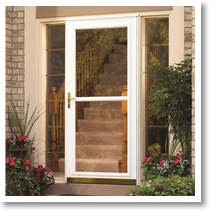 Make the perfect first impression with a stylish replacement door from Window World of Memphis. Why Buy From Window World? Window World of Memphis prides ourselves on delivering beautiful products and providing exceptional service to our customers. All of our doors are quality-constructed with durable materials made to stand up against the elements. Browse our selection below and become inspired for your next home project. If you have trouble deciding which door is right for you, schedule your free in-home estimate where a Window World professional will discuss the perfect option that fits with your style and budget. Our front doors not only enhance the curb appeal of your Memphis home, but they offer protection from elements like severe weather. Browse our door styles that come with a wide array of paint, stain, glass and hardware options for customization. Make the transition from indoors to outdoors in style. Our patio doors are constructed with thick glass, so your view into your backyard is never compromised. Opening up towards the inside to let in the optimal amount of fresh air, French doors are an elegant addition to your living space. This style is also energy efficient, keeping your room cool in the summer and warm in the winter. By combining the design of a French door and the functionality of a sliding patio door, this option is perfect for your Tennessee residence. Details like a 5” top rail, 7” bottom rail and curved handle enhance the appearance of this product. As Memphis residents, we know how finicky the weather can be. Options like a retractable screen door make it easy to enjoy the summer evenings without the pesky insects and humidity. Don’t forget to schedule your free in-home estimate! We want to help you on your next home project, so contact the experts at Window World of Memphis and be on your way to enjoying a beautiful new door.